I was raised in Southeast LA County, in the shadow of the 710 freeway, a community suffocated by rail yards and freeways. It is a region identified by the U.S. federal air quality standards as one of the worst in the nation. Unfortunately, Southeast cities are often left out of critical county decisions that will impact our region’s quality of life for decades to come. This is true when it comes to air quality, community health and transportation funding. 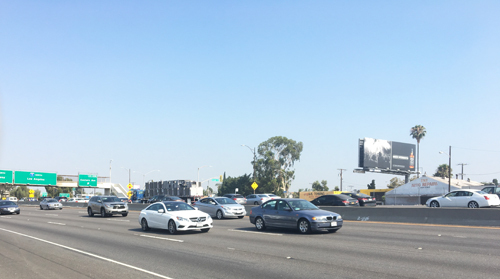 On November 8, voters will be asked to approve the Los Angeles County Traffic Improvement Plan, otherwise known as Measure M, which would enact a ½ cent sales tax increase that will generate approximately $860 million a year for transportation infrastructure improvements throughout LA County. While Measure M addresses much needed transportation challenges, we must ensure that the needs of the gateway corridor are considered, and that our residents have a seat at the decision making table. Indeed, the transit network in the county is in poor health and has challenging and complex needs. Our dated roads and freeways weren’t made to withstand our ballooning population which now tops 10.2 million, resulting in congested commutes that average 81 hours a year for Angelenos. Unfortunately, the planning process headed by the Los Angeles County Metropolitan Transportation Authority (MTA) has rendered the cities in Southeast Los Angeles County largely irrelevant. For example, proposals in Measure M would delay long overdue rehabilitation projects on the 5, 605 and 710 freeways up to forty years. Alternatively, projects on the Westside and in the Valley would be placed ahead of the queue. This is unacceptable and in order to win Southeast support, county leaders must address this inequity in a meaningful way. In a show of solidarity, Southeast leaders have successfully fought for our fair share of Measure M funding. Our cities, stretching from Vernon to Long Beach, have been steadfast and unified in our advocacy for the region. Our collective efforts got the attention of the MTA and LA Mayor Eric Garcetti who have expressed goodwill toward working collaboratively moving forward. I take these leaders at their word and will work with members of the community to ensure projects in our region are prioritized should Measure M be approved. MTA has committed to accelerate development of the Eco-Rapid/West Santa Ana Branch transit line, a 20-mile light rail project that provides our constituents safe, reliable transportation to Union Station in Downtown LA. In a show of good faith, MTA agreed to prioritize state and federal funding that will get southeast transportation projects shovel ready. The mounting pressure has also pushed MTA to include several Long Beach projects such the rehabilitation of the Shoemaker Bridge, the Wardlow Station, as well as expanding resources to address public safety concerns at certain public transit stations, to be prioritized and receive vital funding from Measure M.
I commend our gateway cities for standing up for our working families and highlighting the discrepancies within current MTA funding formulas that disadvantage our neighborhoods. I encourage the MTA, Mayor Garcetti and our regional leaders to continue to work together on behalf of some of our most vulnerable residents. With Measure M, we have an opportunity to fix and repair our aging transit infrastructure, which undoubtedly improves the quality of life and public health for the millions of residents living in 27 cities across Southeast Los Angeles County. But we must do so in a fair and inclusive manner so that all LA County residents benefit. I support Measure M because of this unique opportunity. And like many of my residents, I do so with the understanding that our community will get its fair share. I look forward to working with the MTA, Mayor Garcetti, Southeast leaders and other decision-makers to ensure that this is the case. Sen. Ricardo Lara (D-Bell Gardens) represents California’s 33rd Senate District. A bill to increase the number of Metro board members was re-introduced last week by Sen. Tony Mendoza, who cites the need for a board that more fairly represents all of Los Angles County, specifically southeast communities along the 710 Long Beach and I-5 Santa Ana freeways in great need of traffic relief. Senate Bill 522 would add 10 more members to the Metropolitan Transportation Authority board, increasing the number of seats to 24, ensuring the county’s 10 million residents are equally represented, said Mendoza. Currently, the board is made up of the five county supervisors, four representatives of Los Angeles including Mayor Eric Garcetti, Metro’s CEO, and one councilmember each from the cities of Duarte, Glendale, Inglewood and Lakewood. “With the exception of Lakewood, everything east of the 710 [freeway] lacks representation,” pointed out Mendoza. Under SB 528, three of the 10 new seats would go to the city of L.A. and one each to the city of Long Beach and appointees of the Senate Pro Tem and Assembly Speaker. The remaining four would be filled by other municipalities. Critics fear the bill will diminish the voting power of Los Angeles, the county’s largest city. But with 7 seats on the 24-member board, Mendoza says L.A.’s influence will not decrease. Transportation agencies in surrounding areas have significantly larger boards than Metro. The San Bernardino Associated Governments has 31 members, Riverside Transit Agency 22 and the Orange County Transportation Authority has 18 members on its board. The Board is opposed to any legislation that would change its makeup, Metro spokesman Rick Jagger told EGP. “Any discussion or change in the Board should take place in L.A. County not through a mandate from Sacramento,” he said. Last week, Metro’s board approved a ballot measure that if approved would levy a special half-cent sales tax to pay for more than $120 billion projects in the county’s new transit improvement plan, which includes a new subway line from the San Fernando Valley to LAX, new extensions from Claremont to Culver City and San Fernando to the South Bay. Unlike previous transit funding measures that expire, such as Measure R, the new tax would be permanent. Senate Pro Tem Kevin de León and representatives from other municipalities had asked Metro to postpone approval of the plan and proposed ballot measure until the Senate Transportation and Housing Committee had a chance to review it at a public hearing. De Leon authored SB767 last year, which authorized Metro to place a transportation and use tax on the ballot. “Given the involvement of the state on this matter and feedback Senators have received directly from local stakeholders, we believe it is appropriate to hold an oversight hearing to discuss how Metro evaluated proposed projects … and also to assess the fairness and equity of the plan,” de Leon wrote in a letter to Metro. The public hearing was set for June 24; one day after Metro approved its plan. The refusal to postpone the vote prompted Mendoza to re-introduce legislation to change the board’s makeup. A previous bill authored by Mendoza was shelved by the senator in the hope that Metro would consider coming up with a plan that did not postpone projects in the eastside and southeast communities. One of the projects delayed under the county’s new transportation plan includes a light rail line from Union Station to Artesia with stops in Vernon, Huntington Park, Bell, South Gate, Downey, Paramount and Bellflower. After decades on the shelf, the Eco Rapid transit rail, which serves Mendoza’s constituents, would be pushed back another 20 years to 2047. “This project would help people who are transit dependent,” Mendoza said. The southeast has not seen any new transit projects since 1995 when the Green Line opened. “It seems the poor communities will continue to struggle with congestion, pollution and traffic,” he criticized. At the Commerce City Council meeting last week, City Manager Jorge Rifa said he too is disappointed with Metro’s plan, which would push back much-needed traffic improvements along the I-5 and 710 freeways that wrap around the city. If approved in November, revenue from the added tax is expected to be at least $860 million a year. Some cities, including Commerce, would see their sales tax increase to 10 cents on every dollar.